This page is a translated version of the page Pennino and the translation is 100% complete. The nib has always been one of the most important parts of a fountain pen, and plays the final role of bringing the ink on paper. Fountain pens nibs derive from dipping nibs; the main difference is that being fountain pens much more expensive objects with their nibs continuously in contact with the ink, these were traditionally made of gold to have greater resistance to corrosion of the inks of the time (with different carats, although the most common remains the 14 carat, followed by the 18 carat). When with the evolution of technology it became possible to create steel nibs resistant to corrosion, the biggest obstacle to their spread became that of marketing, and still today we tend to think of a pen with a gold nib as of higher value, although on the technical level this is probably lower. Gold, although strengthened by the metals added to the alloys used to produce nibs, is a very malleable metal, and for this reason a gold nib is subject to bend permanently much more easily than any steel nib and in general ends up being much less robust. A "gold" nib, however, cannot be entirely composed of gold (ie 24 carats), as mentioned this material is extremely malleable,  so it is generally strengthened by mixing it as with other metals to obtain 14 carat alloys, which are the most common, or 18 carat, used to give greater value to the pen, but generally less robust. The ancient pens are however for the most part equipped with 14 carat gold nibs, the 18 carats have been introduced only where, as in France, an object with a lower carat could not be qualified as gold for legal reasons. In the period of the second world war, however, with the restrictions caused by the war, the use of gold for nibs was greatly reduced and in some countries, such as Germany and Japan, even explicitly prohibited. At that time there was a flourishing of various steel alloys, often renamed, especially in Italy, with imaginative and high-sounding names, and experimentation with alternative materials, such as palladium, which now seem to be back in fashion. But the use of steel for nibs can certainly not originate from the constraints of war. In fact, it was adopted by some producers, in particular those oriented to the lower end of the market, well before the war and for simpler economic reasons. Even in that case, however, they often tried to "embellish" the metal with a gilding. Regardless of the strength of the alloy used to produce it, a nib must still have a tip properly reinforced, as the wear would be excessive even for steel. The tip must rub for miles and miles on paper, and to have a durable nib it is produced using a much harder material. In this case the most common choice is that of an iridium alloy, and this is why often, to indicate the state of wear of the tip of a nib, reference is made to the amount of iridium present on it, although in reality this tip may have been made with other metals (for example another choice is that of osmium, or various combinations of both). 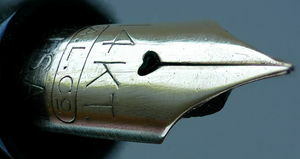 Usually the tip of the nib is made melting directly on place a ball of iridium (or equivalent material), and then it is cut in two dividing the tip in the two tines for the realization of the slit through which the ink coming from the feeder must pass, and then suitably polished to offer a better smoothness. In general then, both to allow the air to escape from the conductor and to reinforce the end of the slit, the nib is equipped with the so-called "air hole", even if in many cases the only purpose for it is to give a better mechanical strength and flexibility. Some nibs also, such as the Triumph Nib of the Sheaffer, or the central nib of the Omas 361, are specially designed and machined to write from both sides, including therefore also the so-called dry side. The nibs are classified classically based on a series of numbers expressing their size, although more or less all manufacturers have adopted similar figures (with values ranging from 00 to 12) the numbers do not have a reference to a precise measure, but are simply a relative indication (a nib #4 is usually larger than a #2 of the same manufacturer), and are different between a manufacturer and another. Very often, see for example the Waterman numbers and the Montblanc numbers, they were also used to identify the different models of a production line. Another possible classification is that made on the basis of the size and possibly the shape of the tip of the nib itself (fine, medium, wide, etc..). Even in this case, there is no universal standardization adopted by all, even if many manufacturers have ended up using abbreviations that are quite uniform among them, such as those shown in the table on the right, most of which are still in use today. A table of nib codes. Again these are relative indications, and not adopted by all (for example Waterman in 1927 introduced a classification based on a colors code), so there may be considerable differences between nibs marked in the same way by differences companies; for example, for the different ways of writing in their respective countries generally a Japanese medium is equivalent to a European fine. A third possible classification, even less uniform in terms of terminology used, and which often has no official reference in the production of the various companies is that one relating to the greater or lesser flexibility of the nib, a classification that also tends to get lost in modern production, dominated by rigid nibs. One of the problems of fountain pens (considered a disadvantage against the ballpoint, and when solved used by manufacturer as a promotion factor for their pens) is that excessive pressure on the nib can harm the same, which makes it quite difficult to trace. For this reason one of the few coherent terminologies is that of the so-called accounting nibs (accountant nib), often also called Manifold, very rigid and hard, usable for this reason also for accounting jobs where carbon paper copies were the norm. sprung: a nib that responds to pressure, but without creating a significant variation in stroke, many modern nibs declared flexible fall into this category. Demi-flex (semi-flexible): a nib which responds to pressure with a significant variation in stroke, but which is normally used without significant variation. Flexible: a nib which produces a variation in stroke even in normal writing, in response to small variations in pressure exerted on it. wet noodle (super-flexible): an extremely flexible nib, which must be used with care even in normal writing, leading to very accentuated stroke variations at minimum pressure. Finally, being an essential element of the fountain pen, the nib has undergone some constructive variations by companies. Initially there was a differentiation carried out mainly in the construction materials of the body and the tip, but until the '30s has always remained virtually identical in form and function. The first significant diversification was the one introduced by Eversharp in 1932, with the variable flexibility nib called "Adjustable Point" equipped with a slider. But the most significant changes began in 1941, with the market release of the Parker 51, which marked the debut of the hooded nib. From then on there were evolutions such as the conical nib of the Triumph, the various versions of the winged nib from Wing-flow onwards, or the particular "inlaid nib'" introduced with the PFM. ↑ malleable (see ) is meaning a very soft material, easy to deform without losing its mechanical properties, in essence the exact opposite of strength and flexibility, gold is one of the most malleable materials that exist. ↑ by classically it is meant referring to the initial period of the spread of the fountain pen, this type of classification has now virtually disappeared. ↑ some examples of how you can classify the tips found here. ↑ Today the problem hardly exists with the spread of digital, but it was not trivial when copies had to be made by tracing with carbon paper. ↑ we started from the definitions of Davis Nishimura, as reported in this article even though they are not completely followed. Patent n° US-132008, of 1872-10-08, requested on 1872-10-08, of John A. Holland, John Holland Pen Company. Improvement in alloys for the manufacture of pens. Patent n° US-269290, of 1882-12-19, requested on 1881-12-14, of John A. Holland, John Holland Pen Company. Pen. Patent n° US-399306, of 1889-03-12, requested on 1888-03-16, of Paul E. Wirt, Wirt. Fountain-pen. Patent n° US-763517, of 1904-06-28, requested on 1903-08-29, of Harry W. Stone, A. A. Waterman. Pen. Patent n° US-772193, of 1904-10-11, requested on 1903-11-09, of De Witt C. Van Valer, A. A. Waterman. Pen. Patent n° FR-360837, of 1906-05-04, requested on 1905-12-11, Roeder. Dispositif formant réservoir d'encre pour plumes et porte-plumes. Patent n° GB-190708313, of 1907-12-31, requested on 1907-04-10, of Duncan Cameron, Cameron. Improvements in Pen-nibs for use in connection with Fountain and other Pens. Patent n° GB-190809818, of 1909-01-21, requested on 1908-05-06, of Duncan Cameron, Cameron. Improvements in and relating to Fountain Pen Nibs. Patent n° FR-396527, of 1909-04-14, requested on 1908-05-06, of Duncan Cameron, Cameron. Bec de plume à réservoir. Patent n° GB-190828493, of 1909-08-19, requested on 1907-04-10, of Duncan Cameron, Cameron. Improvements in Fountain Pen Nibs. Patent n° US-940509, of 1909-11-16, requested on 1908-11-28, of Duncan Cameron, Cameron. Fountain pen nib. Patent n° US-1154498, of 1915-09-21, requested on 1915-04-08, of William I. Ferris, Waterman. Gold pen. Patent n° GB-220793, of 1924-08-28, requested on 1923-06-27, of Theodor Kovacs, Günther Wagner - Pelikan. Improvements in reservoir pens. Patent n° FR-582950, of 1924-12-31, requested on 1923-06-27, of Theodor Kovacs, Günther Wagner - Pelikan. Dispositif pour la fixation amovible des plumes aux porte-plume à réservoir. Patent n° DE-411787, of 1925-04-02, requested on 1923-06-27, of Theodor Kovacs, Günther Wagner - Pelikan. Leicht loesbare Befestigung der Feder am Fuellhalter. Patent n° US-1613811, of 1927-01-11, requested on 1924-05-02, of Charles J. Funk, Wahl Eversharp. Pen. Patent n° US-1613812, of 1927-01-11, requested on 1924-06-11, of John C. Wahl, Wahl Eversharp. Pen and nib and method of producing same. Patent n° DE-440614, of 1927-02-05, requested on 1923-11-20, of Louis Badois, Météore - La Plume d'Or. Dauerschreibfeder aus Metall. Patent n° US-1735199, of 1929-11-12, requested on 1924-08-14, of Charles J. Funk, Wahl Eversharp. Means and method of assembling nibs and feed members for fountain pens. Patent n° US-1735224, of 1929-11-12, requested on 1924-09-13, of John C. Wahl, Wahl Eversharp. Fountain-pen assembling. Patent n° US-1779836, of 1930-10-28, requested on 1926-01-28, of John C. Wahl, Wahl Eversharp. Fountain pen and method of assembling same. Patent n° US-1787406, of 1930-12-30, requested on 1926-08-12, of Donald D. Mungen, Robert Back, Wahl Eversharp. Fountain pen. Patent n° US-1800425, of 1931-04-14, requested on 1927-10-26, of Leon H. Ashmore, Esterbrook. Pen. Patent n° GB-373123, of 1932-05-17, requested on 1931-01-16, of Arthur Gilbert, Mentmore. Improvements in or relating to pen nibs. Patent n° US-1867932, of 1932-07-19, requested on 1927-04-13, of Carl W. Gronemann et al, Wahl Eversharp. Means for making pen nibs. Patent n° FR-729691, of 1932-07-29, requested on 1931-01-16, of Arthur Gilbert, Mentmore. Perfectionnement aux becs des plumes. Patent n° US-1869950, of 1932-08-02, requested on 1931-08-10, of Harry E. Waldron, W. A. Sheaffer Pen Company. Pen. Patent n° US-1882780, of 1932-10-18, requested on 1930-01-02, of Arthur O. Dahlberg, Unbranded. Fountain pen. Patent n° US-1885862, of 1932-11-01, requested on 1931-06-29, of Salomon M. Sager, Sager. Feed bar and pen point. Patent n° US-1918239, of 1933-07-18, requested on 1931-12-24, of Leon H. Ashmore, Esterbrook. Fountain pen. Patent n° US-1939753, of 1933-12-19, requested on 1928-11-19, of Edward S. Wood, Esterbrook. Fountain pen. Patent n° GB-412610, of 1934-07-02, requested on 1932-12-30, of Edward S. Wood, Leon H. Ashmore, Esterbrook. Improvements in or relating to fountain pens. Patent n° US-1980159, of 1934-11-06, requested on 1933-01-23, of Robert Back, Wahl Eversharp. Writing implement. Patent n° GB-420064, of 1934-11-23, requested on 1934-08-31, of Mark Sydney Finburgh, Wyvern Fountain Pen Company. Improvements in or relating to fountain pens. Patent n° US-1989220, of 1935-01-29, requested on 1934-02-20, of Norman E. Weigel, Wearever. Fountain pen. Patent n° US-1999177, of 1935-04-30, requested on 1933-01-31, of Leon H. Ashmore, Esterbrook. Fountain pen. Patent n° US-2012722, of 1935-08-27, requested on 1934-03-10, of Henry Krause, Chilton. Fountain pen. Patent n° BE-410533, of 1935-08-31, requested on 1934-08-31, of Mark Sydney Finburgh, Wyvern Fountain Pen Company. Perfectionnements aux porte-plumes réservoirs. Patent n° US-2016106, of 1935-10-01, requested on 1932-07-14, of Arthur O. Dahlberg, The Parker Pen Company. Fountain pen. Patent n° US-2019734, of 1935-11-05, requested on 1934-12-08, of Salomon M. Sager, Sager. Fountain pen. Patent n° FR-792631, of 1936-01-07, requested on 1934-08-31, of Mark Sydney Finburgh, Wyvern Fountain Pen Company. Perfectionnements aux porte-plumes réservoirs. Patent n° DE-645085, of 1937-05-21, requested on 1934-08-31, of Mark Sydney Finburgh, Wyvern Fountain Pen Company. Fuellfederhalter mit einer den Tintenleiter durch huelsenartig gebogene Lappen umgreifenden Feder. Patent n° US-2089449, of 1937-08-10, requested on 1935-05-06, of Milford G. Sypher, Chilton. Pen. Patent n° US-2105049, of 1938-01-11, requested on 1935-10-19, of Arthur N. Lungren, Wahl Eversharp. Pen. Patent n° FR-850525, of 1939-12-19, requested on 1938-08-23, Stylomine. Gaine pour pointe à écrire. Patent n° US-2208460, of 1940-07-16, requested on 1938-02-21, of David Kahn, Mack Seyforth, Wearever. Pen point and method of making the same. Patent n° US-2228250, of 1941-01-14, requested on 1935-08-27, of Leon H. Ashmore, Esterbrook. Manufacture of writing pens. Patent n° DE-701860, of 1941-01-25, requested on 1934-08-14, of Ernst Rösler, Montblanc, Kaweco. Korrosionsbeständige Schreibfeder, insbesondere für Füllfederhalter. Patent n° US-2254975, of 1941-09-02, requested on 1940-09-04, of Milton R. Pickus, The Parker Pen Company. Material for pen tips. Patent n° US-2267147, of 1941-12-23, requested on 1939-11-13, of Marlin S. Baker, The Parker Pen Company. Process for manufacturing pen nibs. Patent n° US-2289963, of 1942-07-14, requested on 1940-10-24, of Benjamin W. Hanle, Eagle. Fountain pen. Patent n° FR-876230, of 1942-10-30, requested on 1941-06-14, Stylomine. Plumes à écrire. Patent n° FR-879518, of 1943-02-25, requested on 1942-02-20, Bayard. Plume de stylographe. Patent n° US-2316478, of 1943-04-13, requested on 1941-10-21, of Norman E. Weigel, Wearever. Pen point material. Patent n° US-2328116, of 1943-08-31, requested on 1942-09-23, of Norman E. Weigel, Wearever. Fountain pen. Patent n° US-2328580, of 1943-09-07, requested on 1941-12-19, of Milton R. Pickus, The Parker Pen Company. Ruthenium alloy pen point. Patent n° US-2338947, of 1944-01-11, requested on 1941-11-29, of Theodor Kovacs, Günther Wagner - Pelikan. Fountain pen. Patent n° US-2375770, of 1945-05-15, requested on 1943-11-19, of Arthur O. Dahlberg, The Parker Pen Company. Fountain pen. Patent n° GB-569286, of 1945-05-16, requested on 1943-11-16, of Arthur E. Andrews, William F. Johnson, Mentmore. Improvements in or relating to ink reservoir pens. Patent n° US-2410423, of 1946-11-05, requested on 1944-10-14, of Thomas F. Brinson, Scripto. Fountain pen. Patent n° CH-247460, of 1947-03-15, requested on 1943-11-16, Mentmore. Plume à réservoir. Patent n° US-2422351, of 1947-06-17, requested on 1944-12-23, of Benjamin W. Hanle, Eagle. Fountain pen. Patent n° FR-922791, of 1947-06-18, requested on 1946-01-04, Stylomine. Plume à pointe dure pour stylographe. Patent n° FR-925959, of 1947-09-18, requested on 1946-04-06, Stylomine. Nouvelle plume à écrire pour stylos. Patent n° US-2430023, of 1947-11-04, requested on 1944-01-27, of Sydney E. Longmaid, Esterbrook. Writing implement. Patent n° US-2431015, of 1947-11-18, requested on 1943-11-16, of Arthur E. Andrews, William F. Johnson, Mentmore. Ink reservoir pen. Patent n° US-2432112, of 1947-12-09, requested on 1945-04-12, of Charles K. Lovejoy, Moore Pen Company. Fountain pen. Patent n° CH-266126, of 1948-10-22, requested on 1944-10-14, of Thomas F. Brinson, Scripto. Porte-plume à réservoir. Patent n° FR-938710, of 1948-10-22, requested on 1944-10-14, of Thomas F. Brinson, Scripto. Perfectionnements aux porte-plume à réservoir. Patent n° US-2483603, of 1949-10-04, requested on 1946-03-18, of Russell T. Wing, Unbranded. Fountain pen. Patent n° US-2489983, of 1949-11-29, requested on 1944-02-14, of Victor H. Severy, Scripto. Fountain pen. Patent n° FR-961601, of 1950-05-16, requested on 1948-01-28, Stylomine. Procédé et dispositif pour la fixaxtion correcte des plumes des stylographes. Patent n° FR-878818, of 1951-01-24, requested on 1942-01-28, Bayard. Perfectionnements aux porte-plume à réservoir. Patent n° US-2548906, of 1951-04-17, requested on 1945-10-19, of John William Para, Wearever. Fountain pen. Patent n° FR-983319, of 1951-06-21, requested on 1948-03-18, of Armando Simoni, Officine Meccaniche Armando Simoni. Perfectionnements aux stylographes. Patent n° US-2565667, of 1951-08-28, requested on 1948-03-18, of Armando Simoni, Officine Meccaniche Armando Simoni. Reservoir pen. Patent n° GB-656673, of 1951-08-29, requested on 1948-09-27, of Edward Stephen Sears, Swan. Improvements in Nib Sections for Fountain Pens. Patent n° DE-1631271U, of 1951-11-22, requested on 1951-05-18, Montblanc. Schreibfeder. Patent n° GB-666508, of 1952-02-13, requested on 1948-03-18, of Armando Simoni, Officine Meccaniche Armando Simoni. Improvements in reservoir pens. Patent n° US-2598171, of 1952-05-27, requested on 1948-03-06, of Philip C. Hull, The Parker Pen Company. Nib for writing pens. Patent n° DE-856273, of 1952-11-20, requested on 1950-09-11, of William F. Johnson, Mentmore. Feder fuer Fuellfederhalter. Patent n° US-2645206, of 1953-07-14, requested on 1948-06-04, of David F. Mohns, The Parker Pen Company. Writing pen. Patent n° FR-1042361, of 1953-10-30, requested on 1950-09-11, Mentmore. Plume pour porte-plume à réservoir. Patent n° FR-59403E, of 1954-05-25, requested on 1949-07-06, Stylomine. Procédé et dispositif pour la fixation correcte des plumes de stylographes. Patent n° GB-729639, of 1955-05-11, requested on 1951-03-01, of Edward Stephen Sears, Swan. Improvements in Nib Sections for Fountain Pens. Patent n° US-2811948, of 1957-11-05, requested on 1954-06-06, of David Kahn, Morris Levy, Wearever. Locking device for fountain pen. Patent n° FR-1156940, of 1958-05-22, requested on 1956-07-13, of Umberto Legnani, LUS. Perfectionnements aux moyens de fixation de plumes remplaçables pour porteplumes à réservoir, et plumes de rechange perfectionnées correspondantes. Patent n° GB-807974, of 1959-01-28, requested on 1956-10-11, of Kenneth Buckingham Robinson, Stephens. Improvements in or relating to fountain pens. Patent n° US-2987044, of 1961-06-06, requested on 1955-06-18, of Donald H. Young, Waterman. Fountain pen nib mounting.